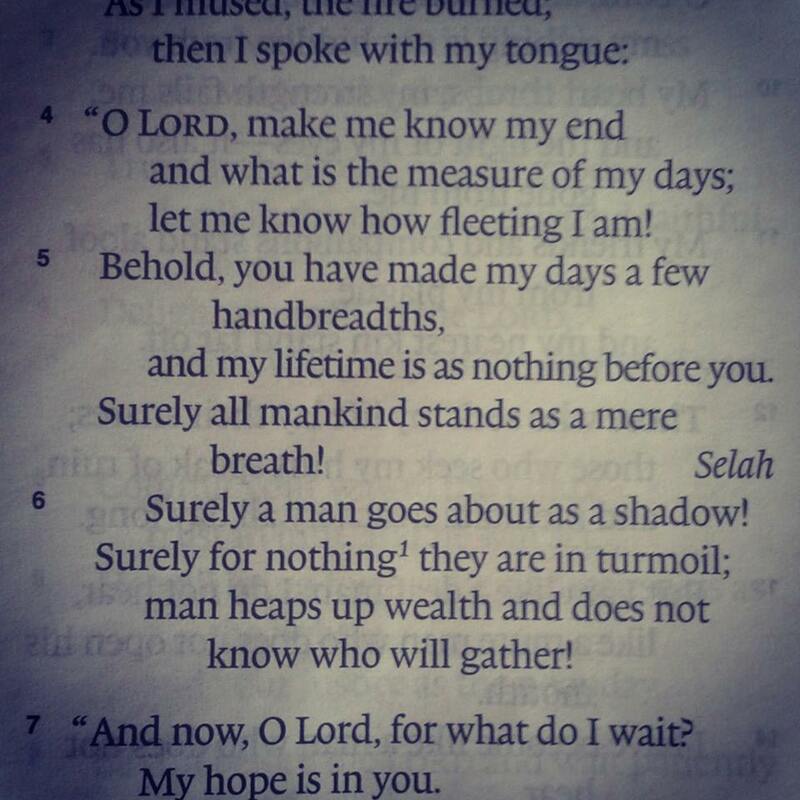 I appreciated this section from (and all of) Psalm 39 this morning. And all during the day, as I wait to see if He has answered us yet, if it’s over yet, I’m forced to consider how much I’m willing to endure for God’s glory. How far would I go to be made into His image more and more? How much would I sacrifice, if He said it was for the better? How much do I mean it when I say, “Thy will be done?” And then “it” shows up, and I have to face my true self. There’s no fake “Take all of me, Lord” prayers when your period gets here. It’s all or nothing now. You either meant it or you didn’t. So I guess, except by God’s undeserved and overwhelming mercy, today I’ll have to answer that question again. And in the meantime, I’m pretending to do other things while panicking inside over what my answer will be, if I have to give it again. I wrote this in a post in January about my expected time-of-the-month and the emotions and prayers that come with it each time. I quickly removed it out of embarrassment that I would write so freely about my p-e-r-i-o-d. I’m such a prude about stuff like that. Always have been. But I came across the now-private post a few weeks ago, and was brought to tears. I have been battling for months about whether I should “come out” about this on the blog, but I’m going to, and then I’m going to explain why. …The reason that post brought me to tears is because I actually did experience God’s undeserved and overwhelming mercy that day, and for the first time ever, my period didn’t come. Within a few days, we were dumbfoundedly staring at a positive pregnancy test, unsure if we were in reality or walking in a dream. It actually took a good several weeks for it to really set in, even after the doctor confirmed it. We were (and are) finally pregnant. Throughout the whole first trimester I debated sharing such a heavy thing. In the About section of this blog, I share how discouraging it often was to find an encouraging blog about infertility, only to have it end (or, usually, change) when the writer finally got pregnant. I mean, I was happy she was pregnant, but now I was alone again, searching for a kindred spirit. It’s been hard for me to imagine doing that to many of you, who have been reading this blog for encouragement for many months now. 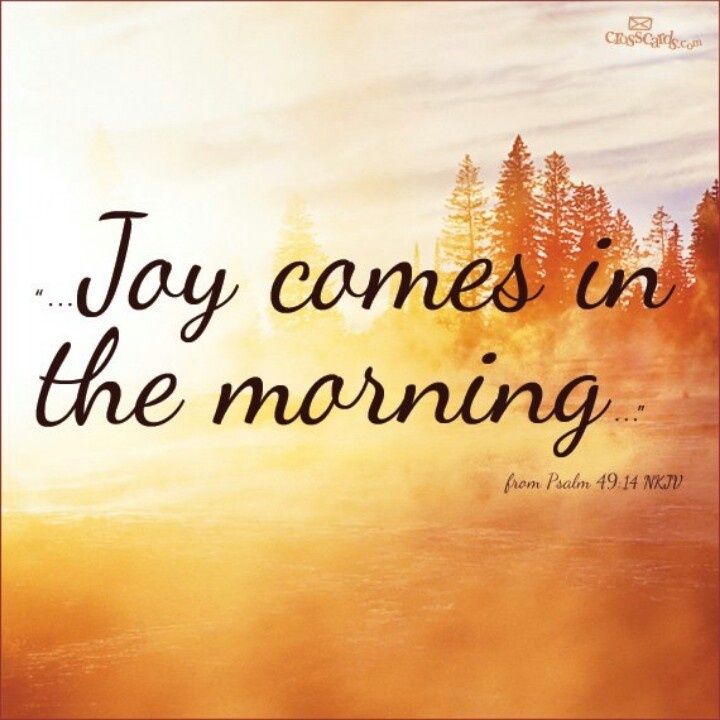 And I thought: I have to tell them that joy really does come in the morning. What kind of encouragement would it be to keep from you such a message of joy and hope — we waited patiently (sometimes a little impatiently) on the Lord, after failed treatments and returning to our third-world home with no idea of what to do next. We begged again for mercy. For a few more months, He still said “No.” And it stung, badly. But still we put our hope in Him through the pain. And then the morning came. And there was joy with it. I always thought it would come roaring and screaming at the top of the mountain. Instead, it came as an unexpected whisper while we were deep in the valley. And I don’t know how your joy will come. It may be a surprise pregnancy test like me. It may be after a few procedures, or several. It may be on a plane home from picking up your new child. It may come quietly, over years of growing in true peace over being childless. It may be something else entirely. But it will come. I am confident of that. I also have to warn you from “this side”…there were initial, surprising, sinful responses that came out of nowhere. Things like, “What did we do right this time?” and “It must’ve been our extra faith this month.” But we quickly squelched that. It was God’s undeserved mercy and His perfect plan. 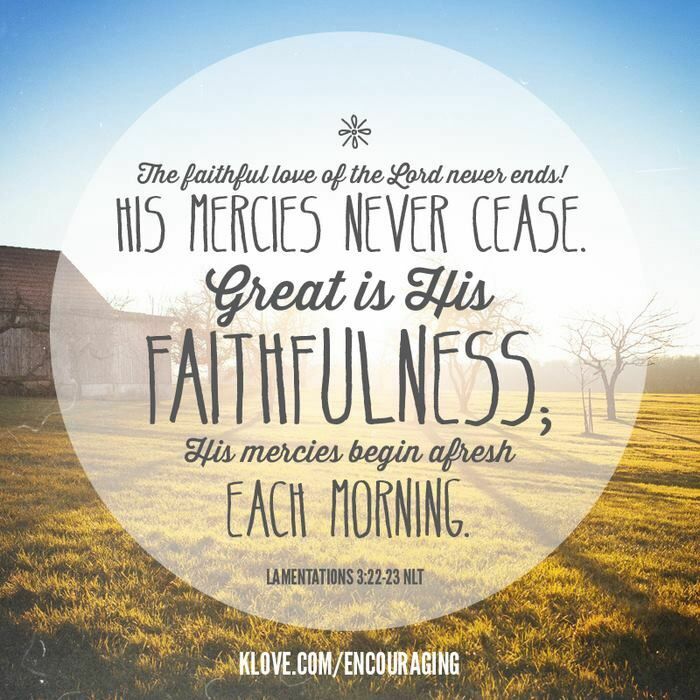 His faithfulness. And that’s it. The second, less sinful thought that overwhelmed me for a few days was, “______ months… that was the allotted time of our trial. I hope I spent it well.” And I want to leave these two thoughts with you. The first is not to waste your allotted time in this trial! Whether you’re given a few months or many years of barrenness, may you use every day for God’s glory and your sanctification. And secondly –I hope you are only encouraged, and not cringing, to hear the truth: God is merciful, just as we were hoping. He is faithful, just as we’d expected. 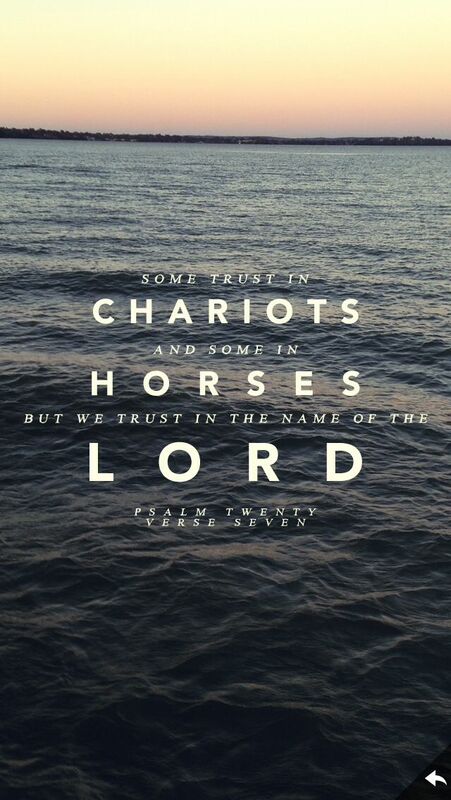 He is trustworthy. This really was the better plan. I used to write those things on this blog in faith, and now I write them from experience. I’m sitting here no longer barren, five months pregnant, and overwhelmed by that truth. He was trustworthy all along. And if He takes this baby today, I will still cling to that truth. I hope you can too, even today! We have struggled in recent months with feeling like we are only receiving silence from God. We feel we keep praying for direction, for answers, for help, and getting nothing back. It’s painful sometimes. We’ll take anything from Him but it feels like there is nothing. Often when I pray, “Speak to us, Oh God!” I know the answer is, “I already have.” And even though you really kind of want a voice to say, “Ok, go for IVF” or whatever, you know this is the true answer. He’s already spoken. 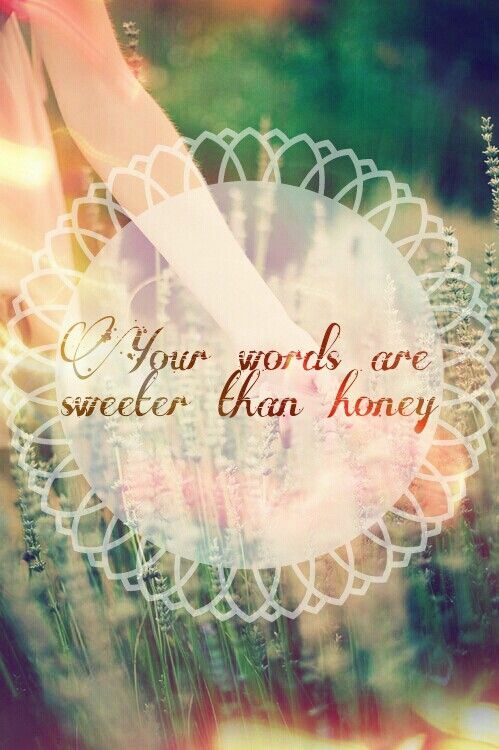 His word is a light (Psalm 119), His word has power (Hebrews 4:12), His word is truth (John 17:17). 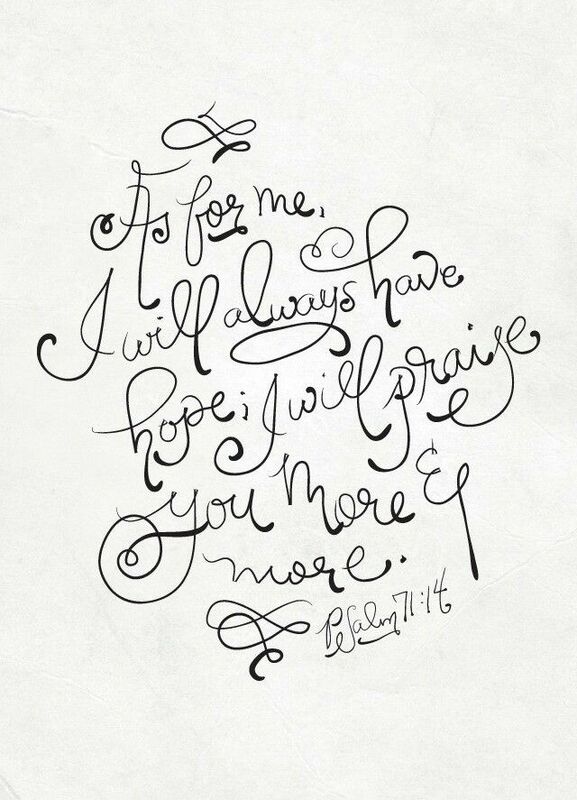 When I thought, ‘My foot slips,’ Your steadfast love, Oh Lord, held me up.